The only downfall to cobbler is the fact that making it in the oven really heats up the kitchen. Ugh. That’s awful in the summer. 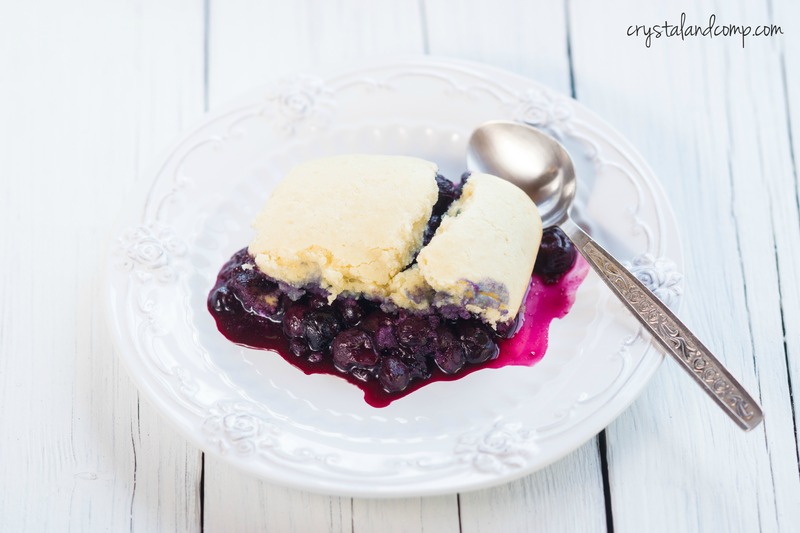 Let me show you how to make crockpot blueberry cobbler. Yum! Easy recipes like this are a favorite at my house. I love this recipe. It’s cake-like texture is spot on! It would be amazing with a scoop of vanilla ice cream, too. Here is how you make this easy dessert that would be perfect for a family get together and it cooks in only 2.5 hours on high! Mix together the flour, 1/4 cup of the sugar, baking powder, cinnamon, nutmeg, sour cream, water, eggs, and 1 tsp of the lemon juice. Mix until creamy removing as many lumps as possible. I simply used a whisk. 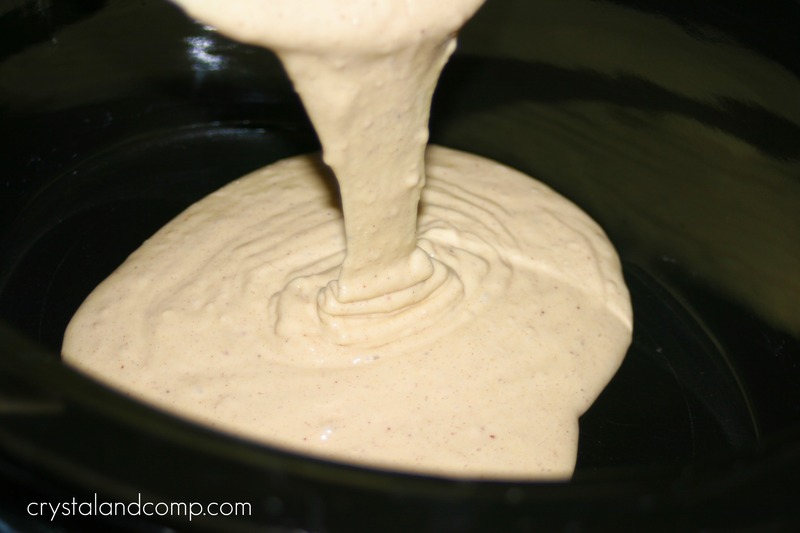 Pour the batter into the crockpot. In a bowl, dump in your blueberries. I suppose you could use just about any frozen berry you want. Add the remaining 1 cup of sugar and 2 tsp of lemon juice. 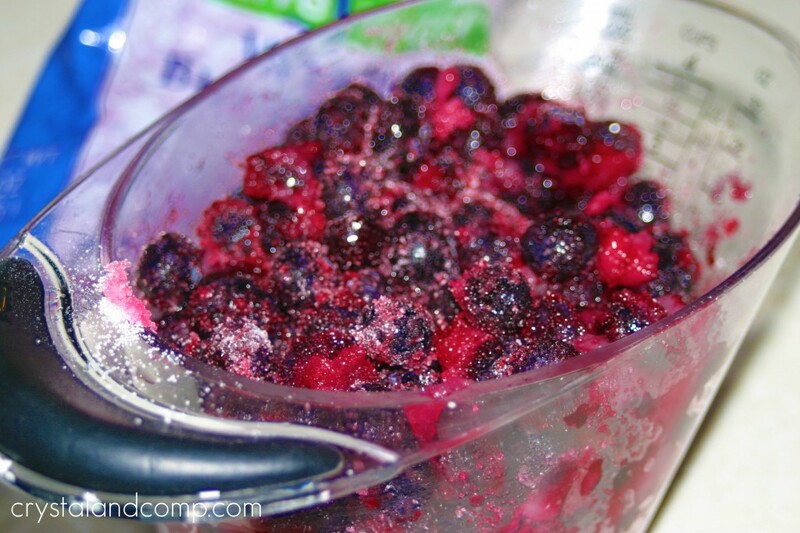 Dump the berries into the middle section of the batter that is already in the crockpot. Put the lid on the slow cooker and cook on high for 2.5 hours. Scoop it up and serve. Add a scoop of ice cream if you want. While you’re here, check out all of our easy dessert recipes. We have tons you will love! 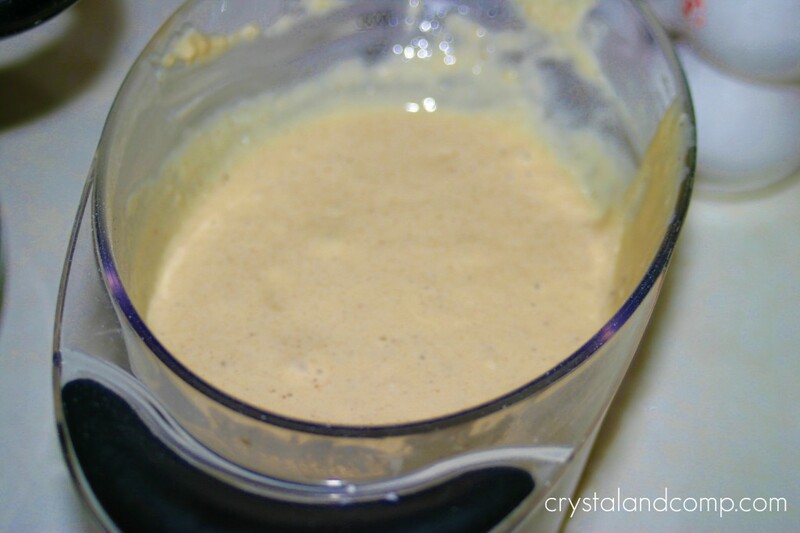 Mix together the flour, ¼ cup of the sugar, baking powder, cinnamon, nutmeg, sour cream, water, eggs, and 1 tsp of the lemon juice. 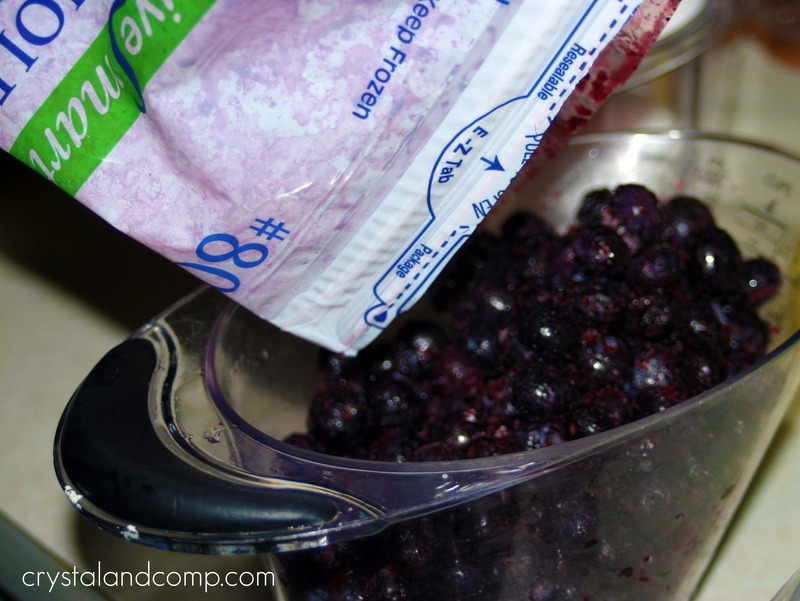 In a bowl, dump in your frozen blueberries. I suppose you could use just about any frozen berry you want. Put the lid on the crockpot and cook on high for 2.5 hours. This sounds delicious! 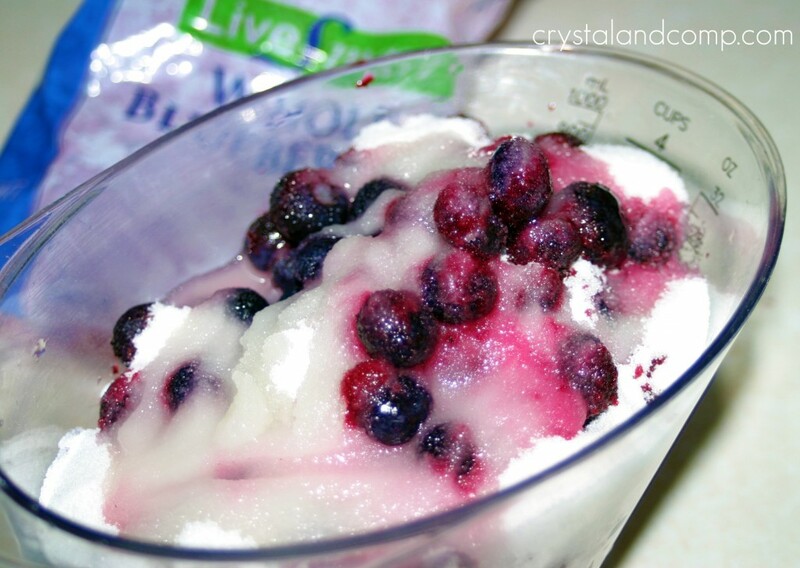 I love both my crock pot and blueberries so I’m pinning this to try it out! Justine recently posted..Try this. Seriously. Sounds so good, I will try this one. Mandi@BoredomBustingMommy recently posted..Bubble wrap races and "Mandi’s Menu"
I found you through Mouthwatering Mondays. This looks amazing and cannot wait to make it for my boys! Thank you for sharing! So glad you found me, Debi! I hope your boys enjoy it as much as mine did. Thanks for reading. I’ve tried cobbler in my crockpot once and it was so good! I love cobbler 🙂 Thanks for sharing! I have blueberries in the freezer waiting to be made into something and this is it! I made a cobbler the other week but this sounds way yummier! Thanks!! Thank You!!! I bookmarked this and finally got around to making it today–I used frozen strawberries, because that’s what I had on hand. Delicious! Very easy and no heat from the oven. I “pinned” this recipe for future use! This is my first time at your blog, and I love how everything is organized so nicely. Thank you so much for your kind words, Rikka. I am happy to know everything is organized from my readers perspective! I’m wondering what size crock pot. I think cooking time would vary if you have a different size crock pot. I have a 6 or 6.5 quart crock pot. Crystal, I have made this a few times now with different fruits, and it comes out perfect every time. My husband was bragging to his mother about how good this is, so I sent her and Hub’s sister your link! Thank you again! Someone asked about the size of the slow-cooker–I am using a plain old Crock Pot. Mary Beth- that is so awesome to hear that a variety of fruits work well. Good to know. I should try frozen blackberries. I love blackberry cobbler. My crockpot is a 6 quart, so it likely cooks the cobbler faster than if I used a 4 quart. It’s official – you are the queen of the crockpot! I just made this but subbed plain low-fat yogurt for the sour cream. Used frozen berry blend from Aldi. It is soooooooooooo good! Awesome, Molly! So glad you loved it and so glad the substitution worked! yum-o I love desserts in the crockpot in summer! Yummy! I love the crockpot! Follow me @ http://www.six-cents.com for some other crockpot ideas! Looks so good! 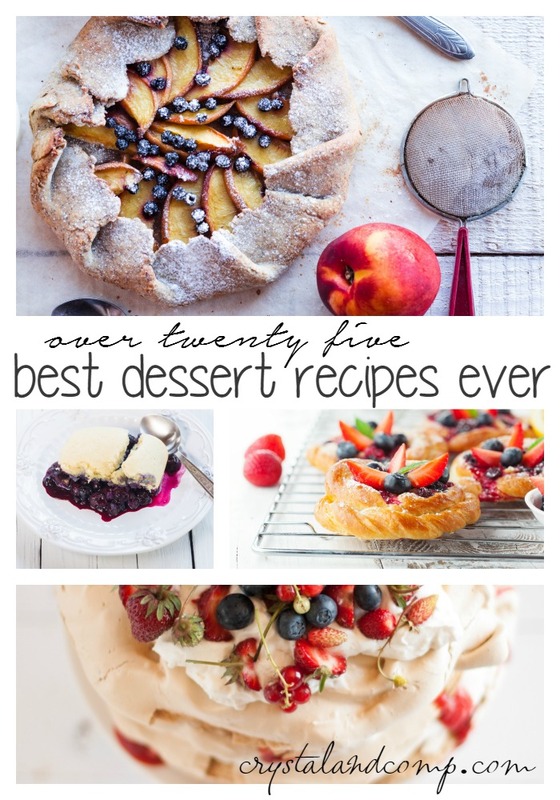 That’s my kind of dessert, thanks for linking up! I am new to crock pot and at the same time amazed by the possibilities of using it. your recipe is definitely a keeper!!! This looks delicious! I am going to give it a try! 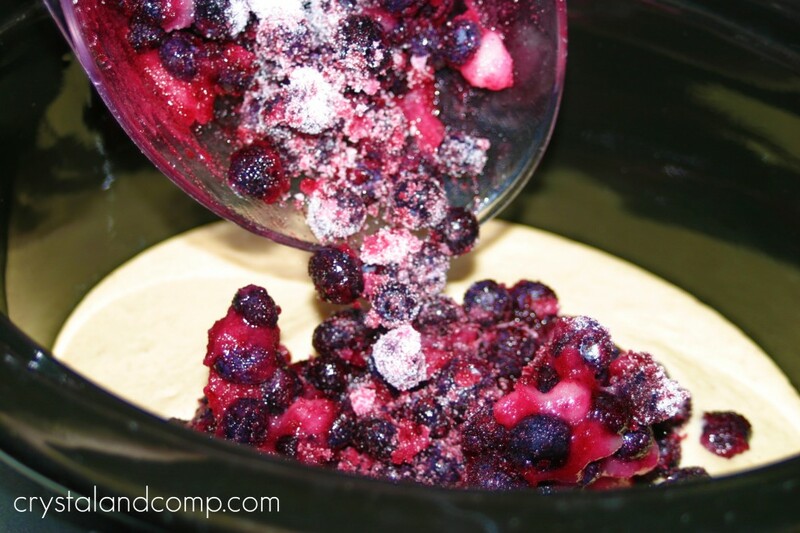 What a great idea… I love cobbler, but have never thought of doing it in the crock pot. Thanks for the recipe! 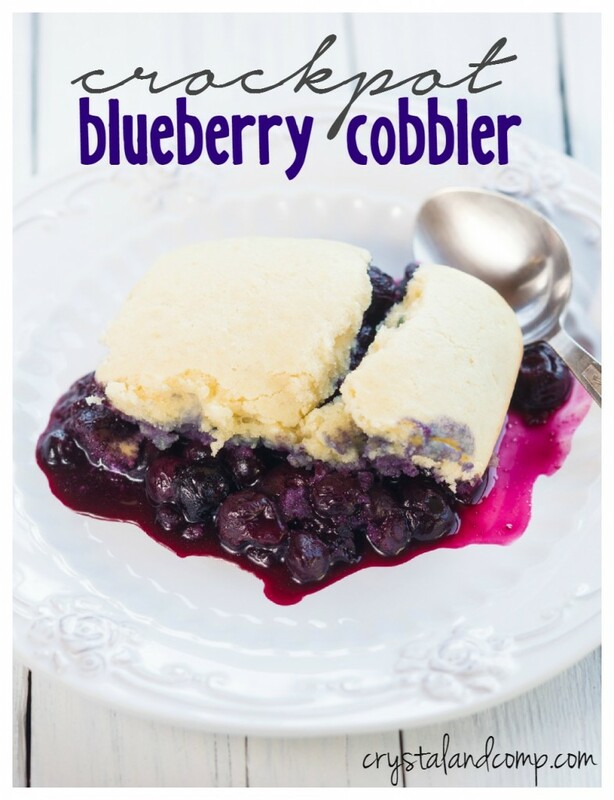 Maggie- if you like blueberry cobbler, you’ll love this. Yum! Looks delicious–might have to try a gluten free version! Does it have to be frozen or can it be fresh blueberries? Krista- I am sure fresh would work just fine. Let me know your experience if you do use fresh berries. This looks awesome! I want to make it for a Labor Day picnic on Monday. I already have lots of frozen blueberries in the freezer in gallon bags. About how many cups of berries would you say it needs? I know 1 cup = 8 ounces, so would 2 cups do it? Thanks! I made this today and wow it was so good I couldn’t stop eating it. I did double the flour part. Tammy- did your guys love it? I am trying this right now in my crockpot! It smells so good and we cant wait to try it! If we like it next time we are going to try different berries! I love using my crockpot! So we tried this and LOVED it! It was so good! The next time we do it we are going to do alittle more of the batter and we are going to try raspberries it was so great! The best thing I have ever tried lol! Hi Tiffanie, I am so happy to hear you enjoyed it. I love the batter part too- more is always yummy. I am eager to hear how amazing it is as a raspberry cobbler. Pinned, tweeted & scheduled on my FB page. Thanks for linking up at the Inspiration Spotlight Party. You absolutely can spray it with a non-stick spray, but you do not have to. I did not. I love cobbler! Thanks for sharing with us at Family Joy Blog Link Up Party this week. Hope to see you next week! What could be better than blueberries AND the crock pot? Yum!! Would love to have you share at the What’s for Dinner lik up! This looks so delish and carefree! I love the crockpot idea! Thanks for sharing with us at Throwback Thursday! This is the perfect dessert to bring to a party! So easy to make, absolutely delicious and everyone loves it. Thank you for another wonderful recipe. I’ve owned my crockpot for SO many years now, and I have yet to make a dessert in it. I never think about cobbler, but this recipe will be so awesome for summer! Yes! I get craving cobbler in warm weather as well! I have never tried making it in the crockpot before now but it was so easy and delicious!